An international dimension. 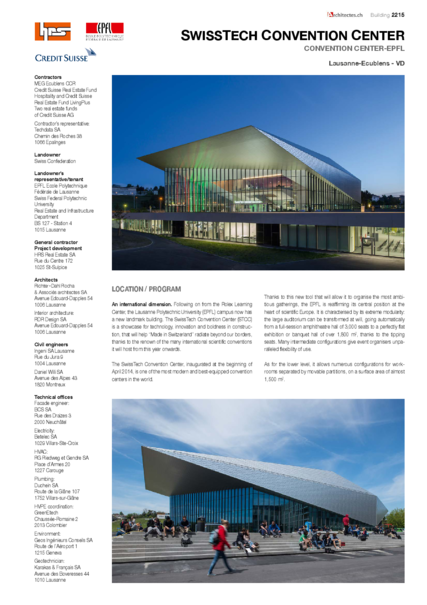 Following on from the Rolex Learning Center, the Lausanne Polytechnic University (EPFL) campus now has a new landmark building. The SwissTech Convention Center (STCC) is a showcase for technology, innovation and boldness in construction, that will help “Made in Switzerland” radiate beyond our borders, thanks to the renown of the many international scientific conventions it will host from this year onwards. The SwissTech Convention Center, inaugurated at the beginning of April 2014, is one of the most modern and best-equipped convention centers in the world. Thanks to this new tool that will allow it to organise the most ambitious gatherings, the EPFL is reaffirming its central position at the heart of scientific Europe. It is characterised by its extreme modularity: the large auditorium can be transformed at will, going automatically from a full-session amphitheatre hall of 3,000 seats to a perfectly flat exhibition or banquet hall of over 1,800 m2, thanks to the tipping seats. Many intermediate configurations give event organisers unparalleled flexibility of use. As for the lower level, it allows numerous configurations for work-rooms separated by movable partitions, on a surface area of almost 1,500 m2. Innovative financing was set up allowing the balancing of rental and running costs for a convention center that is open to other types of events, not only scientific or academic. Within the framework of a public-private partnership between the Swiss Confederation, HRS Real Estate SA, which provided planning and implementation for the whole neighbourhood, Credit Suisse Real Estate Fund LivingPlus and Credit Suisse Real Estate Fund Hospitality, two Credit Suisse AG real estate funds, which funded the entire general contractor agreement, the tune of 225 million Swiss francs. This amount includes construction of the Quartier Nord, a complex including shops, services, student housing and a hotel, which in addition to the Starling Hotel, supplements the housing available immediately adjacent to the campus. This is the realisation of a true “living campus” where students can live day and night, resembling the campuses of great universities around the world. The EPFL is the sole tenant of these buildings, built on land belonging to the Swiss Confederation, thanks to the grant of 99-year surface rights. Designed by the Lausanne firm Richter Dahl Rocha et Associés architectes SA, the STCC also uses other pioneering technologies. In particular, it rests on piles, some of which function simultaneously as geothermal probes crammed with sensors to enable the further development of this energy-cutting technology. The West facade is also covered in transparent and coloured solar collectors, using the principle developed by Professor Grätzel of the EPFL, and directly integrated into architecture for the first time. Financed by Romande Energie, this innovative solar plant also serves as a sunshade and is a new reflection of the partnership between Romande Energie and the EPFL to develop a large-scale solar park and to carry out research and development projects. The chromatic composition of the panels that illuminate the highly technical west facade is the work of Lausanne artist Catherine Bolle, who has already collaborated with the architects on several occasions. Besides cutting-edge multimedia set-ups in each of its rooms, the STCC is also equipped with smart screens whose contents adapt automatically to where they are located. These screens can communicate with event participants’ mobile phones or tablets, for example to send them working documents. Innovative equipment and architecture. From an architectural point of view, the construction of the Convention Center is part of a group of buildings forming a neighbourhood of the “city” that the EPFL has become. The Quartier Nord, directly served by a metro station, has a medical center, a hotel, shops and public spaces, creating an interface between the campus for the students who live there and its urban environment, like a link between the world of science and society. Like a “faceted stone”, the metal roof of the SwissTech Convention Center has become a new symbol, both technical and futuristic, on the EPFL campus. Generated by the interior space necessary to hold the 3,000 seats in the amphitheatre, it rises progressively from the ground like a wing in fragile suspension on the huge glass facades facing south and north, allowing natural light to enter the foyer and the auditorium. Actually, this construction of 1,000 tonnes of glass and metal requires a complex and original supporting structure. A metal frame was the only way to obtain the desired lightness and the long spans required. This tri-dimensional structure in the shape of a catamaran rests on two pairs of concrete pillars, serving as service shafts, placed in the center and at the north of the building. On the south side, these beams are cantilevered over more than 40 metres, a considerable feat that surpasses the roof of Jean Nouvel’s Cultural and Convention Center in Lucerne by almost 10 metres. The irregular shape of the roof is the outcome of studies on the interior volumes of the hall, to ensure that everyone can enjoy listening comfort and a good view of the stage. The exterior roof cladding of anodised aluminium diamond-shaped “tiles” contrasts with the more intimate and warm natural wood interior cladding. In turn, this refined and light cladding contrasts with the imposing and unrefined presence of the vertical cores and the balconies of the great atrium. Maximum modularity. Thanks to “Gala Systems” technology from Canada, the great auditorium can be transformed in 15 minutes, offering a perfectly flat zone or a subdivision into 330, 468, or 1,670 seat auditoriums. This flexibility allows several lectures to take place simultaneously and gives speakers the advantage of addressing rooms whose capacity is adapted to the number of attendees. The operation consists of sliding the seats under the floor by means of a patented system of motorised pivots hidden under the structure of the platforms and linked to each group of seats. All components are designed to ensure rigidity and stability in every configuration. Only eleven other auditoriums in the world have this equipment that gives an unrivalled degree of flexibility. The Grätzel facade, a world first. This prototype is the first use of this technology on a public building and on this scale. 300 m2 of dye-sensitized solar cells are integrated into the west facade, using an invention by Michael Grätzel, EPFL professor. These translucent cells, reproduce the photosynthesis capabilities of plants, regardless of the angle of incidence of light. Besides producing green electricity, they protect the building against direct radiation, thus decreasing the need for cooling energy. Intelligent geothermal energy. Because of the low load-bearing capacity of the soil, the building rests on 200 piles. Five of these are experimental thermal piles 20 metres deep, combining foundation elements and a heat exchanger. Covered in collectors, they will allow Professor Laloui to develop low-energy geothermal technology that uses the very stable ground temperatures at this depth as a heat source in winter and a cooling source in summer. High-tech multimedia. Assembling the latest tech-nologies in the field of multimedia, the STCC is equipped with pioneering devices intended to make convention attendees’ experience unforgettable. For example, the reception desk’s circular screen with 17.3 m2 of high-definition information or – a world first – the 10 mobile information totem poles that automatically manage signage according to where they are installed. Applied ecology. For decades, the EPFL has been committed to sustainable development on its campus. The STCC was a further opportunity to use all energy sources available nearby and to showcase emerging energy technologies. The EPFL is cooled and heated by the water of Lake Geneva. For the Convention Center, thinking was pushed one step further to use the heat from water that has cooled the EPFL buildings. Extraordinary landmark. The SwissTech Convention Center, under its very sober exterior, is nonetheless very complex. in the project while still meeting safety standards. The capabilities of these companies, most of them local or Swiss, enabled a final result that has met with unanimous praise both for its boldness and its construction quality.